The absolute best part about living in New York is that the world comes to you. You don’t have to travel across any oceans to experience holiday food traditions of other countries. 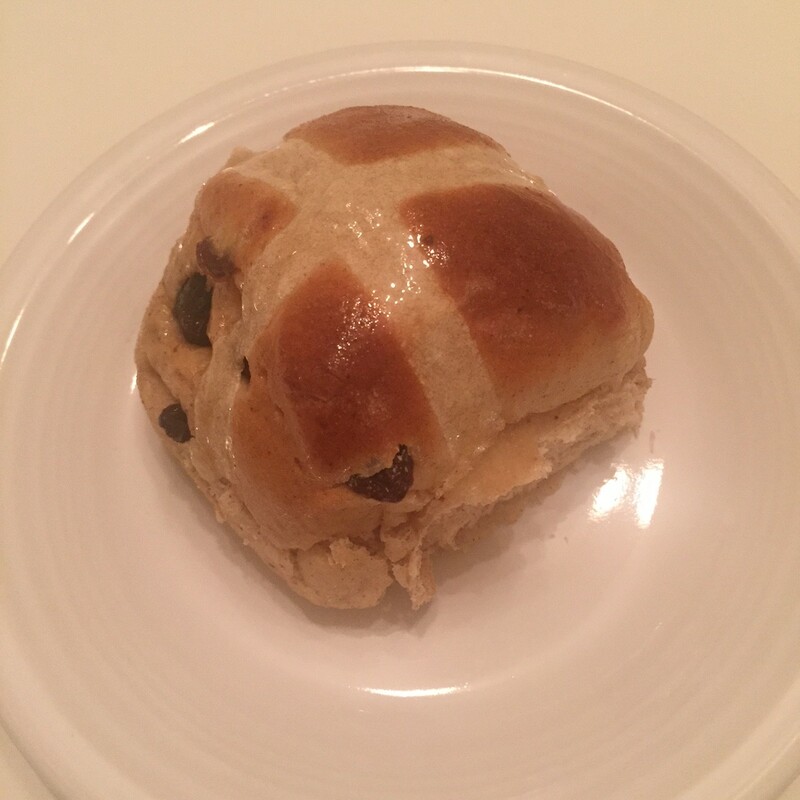 With a holiday like Easter, there are hundreds of church services in whichever tradition you choose to attend, and foods from all cultures are available here. I was at Amy’s Bread Cafe inside the New York Public Library and they had Hot Cross Buns for sale. Lea Ringer provides us with a recipe for these. I must admit that I have become more interested in all things British since binge watching Downton Abbey. I still need to get caught up on Season 6, though. The second recipe for Pizza Pasquale is provided by Angelo Di Stefano, a transplant from Italy. All of the clients at work are in love with his accent. Don’t be fooled by the word pizza in the title. It is a loaf of bread baked in a round tin. There’s no sauce and no throwing of pizza dough. your appetite is ready for these soft, spiced, fruited pastries. 1 Grease a 13 x 10 baking tray with butter and set aside. 2 In a medium bowl combine the warm water and yeast. Mix until dissolved. 3 Add the sugar, dried milk and egg and whisk until combined. 4 Add 1½ cups of the flour and mix well with a wooden spoon until it looks more like a smooth batter. 5 Cover and let rest for 30 minutes. 6 After 30 minutes it should look bubbly but still very wet. Add the oil and salt and fold through. 7 Add the remaining cup of flour and mix into a ball. Transfer to a stand mixer with a dough hook and add the spices. If the dough is still a little wet, add another tablespoon or two of flour. 8 Mix the dough on low speed for 5 minutes. Add the raisins and mix for another 2 minutes. 9 Transfer the dough to your table and form the dough into a ball. 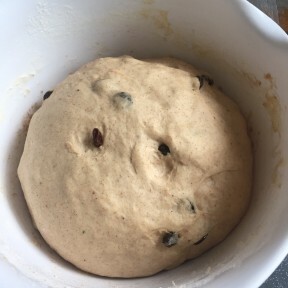 Place the dough into a bowl which has been lightly greased with olive oil. Cover and let rest for about another 30 minutes. 10 Divide the dough into 12 equal pieces, and roll into small balls. An easy way to do this is to cup the dough under your palm and gently roll it in a circle while gently pressing down on it. 11 Place all 12 dough balls onto the prepared baking tray in a 4 x 3 formation. 12 Cover with a clean towel and let rise for another hour or until they have started to come together on the tray. 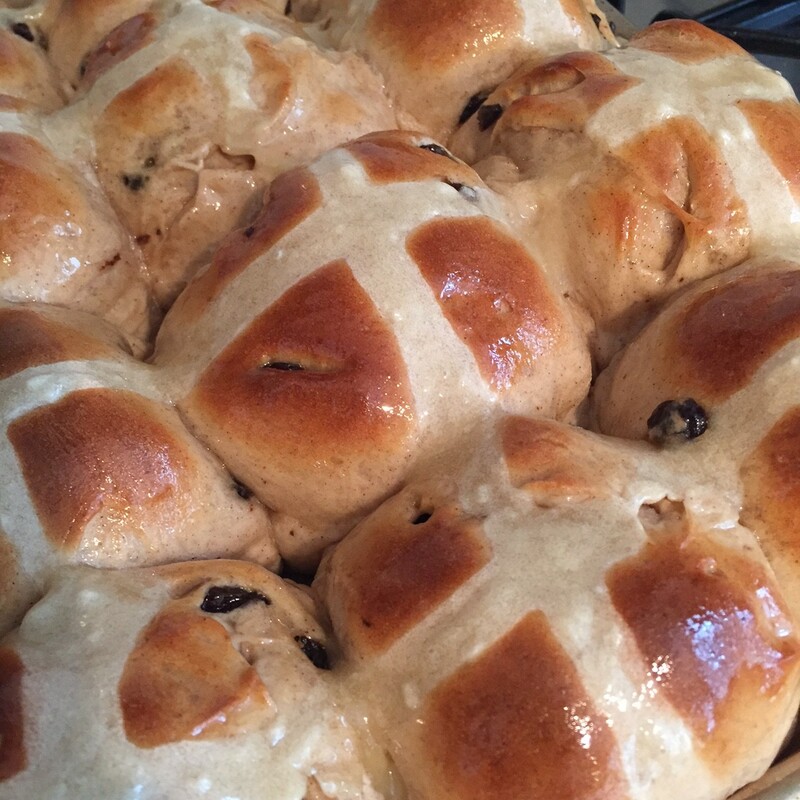 13 While they are rising make the mixture for the cross. Mix the water and flour together to form a paste. 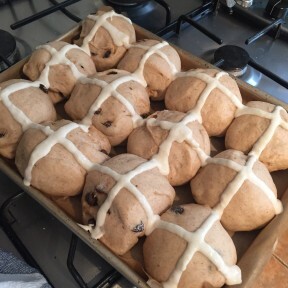 Once the buns are ready for the oven, using a piping bag or zip lock back with the corner snipped of, squeeze the cross mixture across the buns in both directions to form the cross. 14 Preheat the oven to 380 degrees F.
15 Place in the oven and bake for about 20-25 minutes and golden brown. 16 Bring the sugar and water to a boil in a pot. Simmer until reduced to about three-four tablespoons of liquid still left. 17 Glaze the buns when they come out of the oven and let cool. Cover and seal if you’re keeping them for the next day. Easter in Italy is one of the biggest celebrations we have. Of course, the first one is Christmas but actually Easter is a great day to spend with your family. For most people, this day is a celebration of the resurrection of Jesus Christ and after the morning mass at the church the whole family is reunited to have a big lunch. One of the big dishes is the baby lamb with potatoes cooked in the oven. In my family, we decided not to have the lamb, because for this event thousands of baby lambs are sacrificed and usually we have a big lasagna, baked potatoes and “The Pizza Pasquale”, a typical dish from Rome (that’s the recipe that I want to share with you), and obviously a lot of sweet baked stuff, cakes etc. Wine also can’t be missed. Mix all the solid ingredients together except the 200 gr of cheese and 100 gr of salami. Mix the yeast with the warm water and add it to the solid ingredients along with the eggs and extra virgin olive oil. Knead well all and at the end add the diced cheese and salami. Put the dough in a round baking tin and let it rise for 1 hour. In the meantime, preheat the oven to 350 degrees and then let it bake for 50 minutes (or more, if needed).